Welcome back to my series on estate planning. I hope that our articles have been helpful and informative. If anything else, I want to spark thought on this topic and help you begin deciding what you’d like to see happen when you are gone. Okay, let’s get to Trusts! I know, I know. 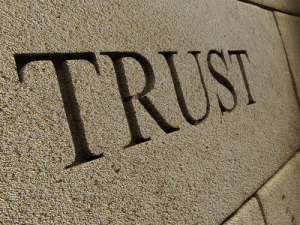 The first thing that you think of when you hear the word “trust” is a debutant or a celebrity that has millions and needs for it to be doled out slowly so it is not wasted. It’s actually an avenue for many of us “average Joe’s” to make sure that our little ones, or our relatives that can’t care for themselves, are cared for. That said, not everyone needs a Trust. Often I hear questions from people that want a trust because they have heard about trusts but truly don’t need one. I also get questions such as “Why do I need a trust?” Their thought is that – hey I already have it all laid out in my will. I don’t want to complicate things. A trust is needed if you have young children, or people that may not be able to properly manage their own funds (due to mental handicap, physical disease, immaturity, etc. ), that could possibly inherit your assets. Even if you do not have such a person as a direct beneficiary, they may take by default if your named beneficiary predeceases (dies before) you. For example, if you leave your estate to your son, but he has children, in the event that he predeceases you, his children will inherit his portion (assuming that you do not designate otherwise). If those children are young, you need to plan for that. To determine if you need a trust, the best thing to do is sit down with an attorney and discuss your wishes for the future. Contact me when you are ready to meet and discuss, or update, your estate plan. Remember to follow me this week for a series of articles about the many areas of estate planning. Always remember to check out my answers to questions posted on our Facebook page and check back often for more news, blogs and law updates on estate planning! Marital Property: What is it?